It’s an exciting time at Riverbed! Late last year, Riverbed announced Project Tiger and our vision around SD-WAN. 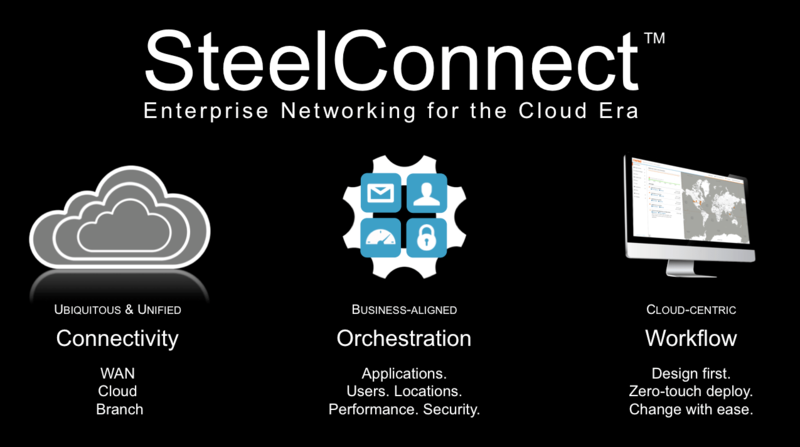 In April 2016, we announced SteelConnect 1.0, a revolutionary application-defined SD-WAN solution. Today, Riverbed announced the availability of SteelConnect 2.0 to drive enterprise networking into the Cloud era. SteelConnect 2.0 provides an intelligent and simplified approach to designing, deploying and managing distributed networks for today’s cloud-centric world. With its unique software defined and app-centric approach, SteelConnect is poised to disrupt the legacy hardware-based approaches to branch networking. SteelConnect 1.0 delivered a fully integrated line of secure WAN gateways, remote LAN switches and Wi-Fi access points, all managed centrally through a cloud console with an intuitive and graphical user interface. It enables organizations to modernize their network architecture to realize the full potential of digital transformation. When I talk to our customers and prospects, it’s obvious that a majority of the enterprises are faced with the challenge of managing the complexity of the hybrid WAN. Gone are the days when the global IT architecture was centralized, secure and operationally efficient. With the ever-increasing adoption of the cloud, demand for bandwidth intensive apps like video, difficulty in identifying encrypted apps and a highly mobile workforce, the distributed hybrid enterprise is now looking at a complex, insecure and an unpredictable network. IT organizations are being asked to increase their agility and respond quicker to the LoB requests. As enterprises go through the digital transformation, it’s clear that the hardware-based and CLI-driven legacy approaches to networking are an impediment to the required agility and performance of the network. Instead of managing networks through configuration of individual appliances, SteelConnect provides policy-based orchestration that is naturally aligned to the language and priorities of business (applications, users, locations, performance SLAs and security requirements). ‘We were attracted to Riverbed because of the possibility that SteelConnect could take our IT operations and business to the next level,’ says Rob Gillan, CTO at Simple Pay, a SteelConnect customer. SteelCentral integration into SteelConnect Manager for advanced SD-WAN visibility with APM & NPM capabilities allowing IT Managers to be better able to make informed policy and deployment decisions, monitor and troubleshoot performance issues, and plan for network changes regardless of whether the application’s performance is optimized across hybrid WANs, remote LANs or cloud networks. With native routing capabilities (support for eBGP and OSPF), SteelConnect Gateways can be used in place of legacy branch routers to reduce the cost and complexity of managing connectivity to remote locations. Riverbed announces two new SteelConnect Gateway models with increased performance and high-availability and a new SteelConnect Switch with increased density and throughput. SteelConnect Gateway 1030 delivers up to 1 Gbps throughput at edge locations while the SteelConnect Gateway 5030 delivers up to 10 Gbps throughput and supports complex networks and high-availability configurations in the data center. These new gateway models enable large-scale enterprise deployments for companies of all sizes. The future of your application-defined network starts here!